Does our world scare the crap out of you sometimes? Do you find yourself feeling powerless in the face of so much violence and division? Would you like to make a bigger difference, but you don’t know how? If so, you’re not alone. It’s easy to feel overwhelmed by our reality and to believe that you can’t make any real, lasting impact amid all the craziness. But you can, and you do make a difference, every single time you show up to life with a kind, open heart. Nothing stands to transform us, our relationships, and our world more than a commitment to live our lives from love. So when you’re feeling powerless, or discouraged, or just plain freaked out by this reality, take some deep breaths and put your love into action. Here are four ways to do that. Think of a time when you’ve been moved by the kindness of another individual — a stranger, a friend, a family member, whomever. How did his or her kindness make you feel? How does it make you feel now to think about the experience? Pretty good, right? We all know how to be kind, and we have all experienced the benefits of another person’s kindness. We are given opportunities to exercise our kindness constantly. Through a smile, a greeting, a compliment. A phone call, encouragement, the benefit of the doubt. Every interaction with another person is an invitation to practice kindness, to put our love into action. And every time we act with kindness, we serve everyone involved, including ourselves. That’s how kindness rolls. Like everything else rooted in love, kindness feels as good to give as it does to receive. Maybe even better. So much of the disconnection we see in our world, so much of the division and anger that exist between human beings, could be alleviated by a more conscious attempt — by all of us — to be more empathetic. We’re all judging and screaming at each other about how wrong everyone else is and how right we are, without really taking the time to consider each other’s experience. How much more peaceful would our world be if we stopped to imagine what it’s like to walk in each other’s shoes? Or if we simply acknowledged it when we already have? Without judgment or having to agree with a person’s choices, and without needing to have experienced whatever it is they’re going through, we can always choose to empathize. We can declare, “I’ve been there,” or that we’re doing our best to imagine what it’s like to be there. Empathy is love in action. It’s a conscious choice, and like all conscious choices, it takes practice. The more we do it, the better we become at it — until empathy is our go-to response. Self-care is having its moment. Not a day goes by that I don’t see articles, blog posts and, of course, memes about self-care — of smiling people in bathtubs, on walks in nature, or sipping mugs of what I assume to be some healthy tea but, based on the crazy, blissed-out look in their eyes, may in fact be quadruple espressos. People everywhere are trying to take better care of themselves. This is great. Important. Necessary. No one will be able to take care of you better than you’re able to take care of you, if you choose to do it. The beauty of self-care is that by taking care of ourselves, we’re also serving everyone who comes in contact with us. I’m much more pleasant to be around after a shower, a healthy meal, or a long nap. Think of all the ways you could make simple tweaks to take better care of yourself. Are you still wearing those shoes that give you blisters or those jeans that barely button and leave a gnarly imprint around your waist when you take them off? Are you drinking enough water? Getting enough sleep? Setting clear boundaries with others? When we consider love in action, we’ve got to consider self-love, too. Self-care equals self-love equals more peace and contentment in general. It’s virtually impossible to feel powerless when we choose to be of service to others. It’s not only empowering, it feels really good, too! Is there an organization doing important work that you love? If so, why not volunteer for them? Through volunteering, you’re likely to meet wonderful people, learn new skills, and directly improve the lives of your fellow human beings. If you’re not able to volunteer, you can always spread the word about their work on social media, or contribute a dollar or five to their cause. Does a friend need help painting her new apartment? Put on some old jeans and grab a brush. Could your grieving neighbor benefit from a hot meal and some company? Cook up your famous chicken noodle soup and knock on his door. Everywhere we look are people in need, and every time we choose to step out of our own stories and into their realities — to be of service — we’re putting our love into action and making a difference for all involved. Being of service is one of life’s greatest healers. Kindness, empathy, self-care, and service are just four powerful examples of love in action. Add to those compassion, forgiveness, and authenticity. From the moment we wake up until the moment we go to sleep, we are given opportunities to put our love into action. The more willing we are to do it, with ourselves and with others, the more positive change we create — in our own lives and in our world. For many of us, 2017 was a tough year, and 2018, no doubt, will have its fair share of hardships, too. Let’s face them, and each other, with as much love as possible. Always. 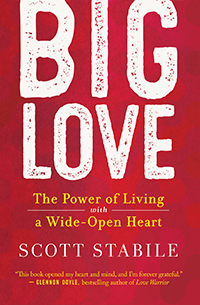 Scott Stabile is the author of Big Love: The Power of Living with a Wide-Open Heart. His inspirational posts and videos have attracted a huge and devoted social media following, including nearly 360,000 Facebook fans and counting. A regular contributor to the Huffington Post, he lives in Michigan and conducts personal empowerment workshops around the world. Visit him online at scottstabile.com.